Lots of fish, "good craic," and a sunburn, In June, I went to Northern Ireland to visit 'home', and got in a day of fly fishing on the Six Mile. Wasn't the best time of year, but with Stevie's help, it turned out to be a great day. It wasn't about catching BIG Brown Trout. It wasn't about the opportunity to catch a lot of Brown Trout. It wasn't about even having a claim to catching truly wild Brown Trout. If anything, it was about.. a spiritual journey that can't be quite explained. It was about "going home" - if you can call "home" as some place you haven't visited in 23 years. It was about walking in my father's footsteps. Fishing a river he used to tell me about he himself fishing many times, many years ago. 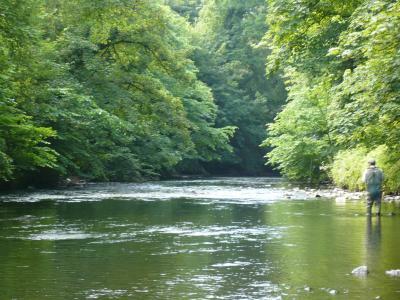 Ah, fishing the Six Mile Water River in County Antrim, Northern Ireland. The Six Mile Water River has not always been a prolific and productive water - but today, is considered by some to be one of the better rivers in all of Europe as far as a fly angler's dream of beauty, zen, and productivity too. I fished a part of the Six Mile 23 years ago - on a visit to the land of my birth and while exploring areas my dad had grown up around and had enjoyed. At that time, the fishing was not good, to say the least. But conservation practices along with rehabilitation has returned the river to conditions conducive for great angling - and although Catch and Release is encouraged, it's not demanded. When suddenly an opportunity came about for me, 23 years after my last visit, I wanted to make the best of it. I realized that the timing of my sudden opportunity was not the best timing for fly fishing (mid June, 2007) - but I did my research and put my hopes on a man named Stevie Munn, an experienced Irish guide who has his own love for the Six Mile Water, for my "spiritual journey." It was a short trip "home" - only six full days, but one of those days to be spent fly fishing. Come rain, wind, cold, or whatever the weather of Northern Ireland would throw at me, I was determined to walk in the footsteps of my dad vicariously with the help of Stevie Munn. You might expect rain at any time of the year in Northern Ireland - but I returned back to Canada with a sunburn. Stevie Munn picked me up at the Templepatrick "Filling Station," or what we in North America call a "gas station." It was there I needed to purchase a one day Permit for Five Pound Sterling in order to fish the Six Mile Water River. This fee goes to the "Antrim & District Angling Association" and goes toward conservation, employing a Bailiff, and maintenance on the river. This fee is in addition to the "Rod Licence" one must also have to fish in the U.K. I was in possession of a three day licence which I had purchased at J Braddell & Sons Tackle. The day was hot and bright - not an optimum day for fly fishing at all. However Stevie assured me that we would catch some fish and have some fun - and he was correct. Our first stop was a very pretty section of the river in a park where tall trees on both banks offered lots of shade to the river. After tying on a Gold Bead Hare's Ear nymph, we walkded down to the river. The easiest way to cast was on my knees and roll casting, watching for tree branches and bush both behind me and on the other side of the river. 1. The first person to foul hook a 14" Brown Trout near it's bum on their very first cast. (But at least it proved there were Brown Trout there). 2. The first person to catch a 2" Brown Trout on a size 12 Hare's Ear Nymph on the third cast. 3. 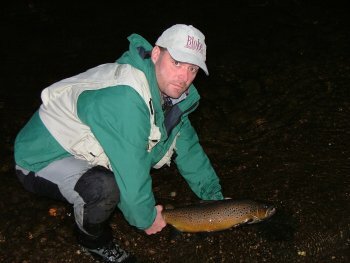 The first person to catch a 3" Brown Trout, after catching a 2" Brown Trout on the previous cast, on a size 12 Hare's Ear Nymph. It was actually quite funny. Here I am, feeling all "spiritual" about walking paths my auld man might have walked, and here I am foul hooking nice trout and catching tiny trout! Very spiritual indeed! But then things got better.. after Stevie teased me a bit about "Canadian Luck." We walked the river side, roll casting to lovely riffles and runs shaded from the bright shining sun by trees everywhere - and fish on! Not huge fish mind you.. the largest probably came in about 15" - but wild fighting Irish Brown Trout and even with the horrible conditions... it turned out to be fun and pleasure. It was disappointing to me that there was very little dry fly action. But as long as I followed my guide's instructions, used the flies he suggested (mostly the Hare's Ear Nymph), and fished them the way he recommended, I regularly caught fish most of the day. After we caught some fish on the first portion of river, a quick drive in Stevie's car to a parking lot of a Presbyterian Church, a wee walk through some cow pastures and over some fences found us at another lovely bit of water. Herons stood in the water announcing to us that there were fish about, and a flash of bright metallic purple along the other bank - a Kingfisher looking for prey. And the hot sun - the temperature which had now reached over 33C, and the humidity - even the Irish charm of Stevie Munn couldn't pull much out of this part of the river under these conditions. But as they say in Northern Ireland, "the craik was good." It's one thing to be able to locate a guide over 3,000 miles away that is a skilled and excellent guide. It's another to hit the jackpot and get along as if you'd been fishing together for 20 years. Mind you, Stevie Munn strikes me as the sort of person that would get along with just about anyone. While we were experiencing the high sun and heat of the day, we talked about fly fishing, life, and more fly fishing. Stevie took the time as well to give me some hints and tips about my what he had observed with some of my casting and helped me to improve some things. As a Qualified Game Angling Instructor and a Hardy Greys Certified Instructor, Stevie knows his stuff - and his personality is that of a good teacher. After a late lunch (which was needed just to get out of the hot sun), Stevie took me to another section of the river where once again, we waded, cast, and caught fish. At times, this section could be quite treacherous to the wader who doesn't know the river - calm looking on the surface but with sudden deep drop offs. But lots of fish. We ended our day fishing a lovely spot called "The Surgeon's Pool," so named for a house nearby that has been the residence of a doctor for many years. The trout in this pool seem to prefer a slow figure of eight retrieve and after getting it just right, a good number of nice 12 to 14 inchers were hooked, brought to hand and released. It was a pleasant way to the end the day - a day that I had been looking forward to as far as fishing some water that my father had fished four decades ago - and in the company of a great Ulster caster and angler who not only knows his stuff, but can teach it as well. And not another angler seen the whole day. "Only the Irish would name a 20 mile long river the 'Six Mile Water River'," a friend remarked to me the other day. Except it wasn't the Irish that named it that; it was the Normans. Some traditions suggest that the Normans marked miles from the coast with posts, and the Six Mile Water River, being six miles from Carrickfergus on the coast got the name it is known by today. The original Irish name for the river is The Ollar. It begins in the hills of County Antrim and flows through historic towns and beautiful countryside. Much of the river that I fished with Stevie Munn includes majestic tall trees along the banks - often requiring that fly anglers employ the roll cast. Sometimes even while kneeling in some of the narrower sections so as to not spook the fish. In other areas, the river flows through open farm pastures and casting is quite easy depending on which bank one is fishing from. There are a number of public access points to the river including public parks. Where the river flows through private land, the Antrim & District Angling Association has negotiated access points with landowners and step ladders have been constructed over fences in order to facilitate access. Although I didn't see any other anglers on the river when I fished it with Stevie, I'm told that in the fall when the big fish are running up from Lough Neagh, it can be madness with numbers of anglers in pursuit of the Atlantic Salmon and huge Brown Trout that are in the river. Night fishing is especially popular. If you don't know the river, it is probably best to hire a guide. There are some very unexpected deep drop offs in parts of the river - one step and you're only inches deep wading the water, and the next step, a six foot deep drop off right beside the bank! As pointed out earlier, the river has had its share of problems as far as pollution, poor fish stocks, and conservation. 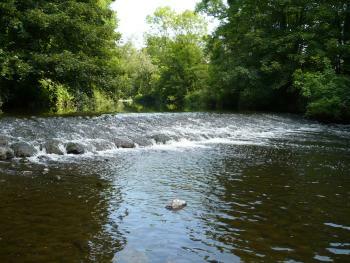 A group of anglers decided to do something about this, formed the Antrim & District Angling Association and negotiated responsibility for the river. With the ability to directly implement conservation practices privately, provide education to landowners on whose land the river flows through, and identify polluters and hold them legally responsibility, the river has become a very good productive trout and salmon river. This was interesting to me coming from North America where the responsibility for rivers is through government - and often means mismanagement. Many in North America are fearful of a "Private" sort of system that controls and manages fisheries, worrying about expense to fish - but from my observations of the Six Mile, it might be something very much worth looking into here in North America. The fees collected (a one day permit issued by the Association was the equivalent of about Ten Dollars Canadian which increases to about 24 Dollars from August to September, and an annual permit is about Two Hundred Dollars) go toward river conservation and even the hiring of the Association's own "Bailiff" who has the power to prosecute illegal activity including poaching on the river. And for that, you get a great river without government bungling and individuals who have a passion and interest for ensuring a strong and growing sports fishery. This kind of system might even go along way to keeping some of the "goons" off the river. 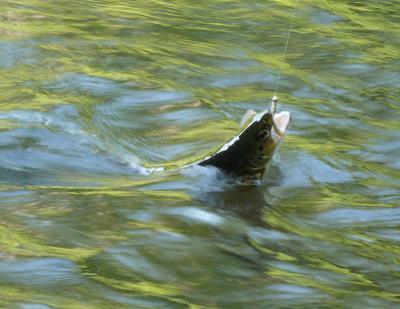 Anglers can even keep some of their catch (2 fish per day, of which only one may be a salmon) - although catch and release is encouraged, it's not demanded. Even without strict catch and release regulations, the river has managed to produce and increase it's trout and salmon population. For what it's worth, I released all of the fish I caught although I would like to taste a wild Irish brown trout. I was amazed at the numbers of small brown trout fry and parr I observed in the river. Brown trout being a canibalistic predatory species will feed on some of them of course, but the sheer numbers indicated to me a very healthy river system. The real big Browns that migrate up the river in the autumn from Lough Neagh are called "Dollaghan." When I decided to visit Northern Ireland, I found through an Internet search the services of Stevie Munn. I got in touch via email and although Stevie was tentatively scheduled to provide guiding and instruction in Norway during the week I was in Northern Ireland, we were able to firm up a date during the time of my visit. I feel quite fortunate in having been able to hire Stevie's services. Stevie has been fly fishing the Six Mile Water River for over 30 years, first with a fly rod his father made him out of an army vehicle antennae. Although he grew up in Belfast, his father kept him off the streets and away from "The Troubles" as much as possible getting him out onto the river in the much more peaceful and calm area of County Antrim. Over thirty years of experience on this river means that Stevie can often predict hatches before they start. Not only the years of experience with fly fishing - Stevie's personality with his Northern Irish wit and charm alone would have made for a very pleasant day even if we hadn't caught fish. He often had me laughing or smiling with some quip and at the same time, I found his general knowledge to be extensive. Fishing with someone for 8 hours that can discuss not only fly fishing, but everything from history, theological differences in religions, customs and fly fishing experiences in other countries (including BC, Canada), and his own hopes for the "peace process" in Ulster made for great company. Stevie is also a beautiful caster! He's taken the courses that Hardy Bros. puts their Certified Guides and Instructors through and of course, has the Hardy Certification. But he's no "show off" either - and I found him to be very helpful in offering ideas and suggestions in regard to my own casting to get that extra 10 or 15 feet I needed in some situations. Stevie is a Qualified NVQ National Angling Guide (NAGA) and a Qualified Game Angling Instuctor (GAIA) approved coach. 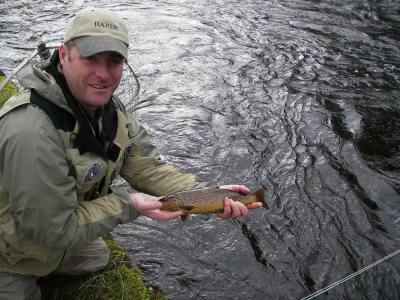 If you're interested in a trip to Northern Ireland including some great fly fishing and great guiding, visit Stevie Munn's website for more and contact information. I have absolutely no hesitation in recommending Stevie. His rates for a day begin at 100 Pounds Sterling - but be sure to bring along extra for a tip as I'm sure Stevie will be earning it. He's a full-time guide and can provide all the equipment, gear, and flies you'll need.